The project to create in Ukraine High Technologies Park BIONIC Hill was initiated in 2011 with the support of Kyiv City State Administration by UDP - leading real estate development and investment market in Ukraine. Innovation Technopark BIONIC Hill is a unique platform, which create the most favorable environment for the effective management and development business in the field of high technology. The key innovation specializations Park are information and communication technologies, biotechnology and pharmaceuticals, energy efficiency and energy conservation. BIONIC Hill is an IT and hi-tech park located in a picturesque green area within Kyiv city limits. A successful project uniting the frontiers of science with business and everyday life, respect and care for a unique and unspoiled slice of nature, an unprecedented standard of living and unrivalled chances for continual personal development – these are the main principles behind the BIONIC Hill concept. The project provides significant benefits on a national scale: it will create up to 35,000 jobs, revenues innovative companies-residents of the park will be about $ 900 million a year, while exports of products with high added value will exceed $ 600 million per year. In addition, it is expected that BIONIC Hill in Ukraine will attract foreign direct investment and the world's best technologies provide a new level of international scientific and technical cooperation, provide incentives for the creation of innovation clusters in the areas of information, biotechnology, energy and other high-tech and provide a permanent source of revenue to the State Budget of Ukraine and local budgets. Construction of the park begins in Q2 2013. Commissioning of the first phase of construction, including business centers, residential property and a number of social infrastructures is planned for Q1 2015. Full completion of the Innovation Technopark BIONIC Hill is expected in 2020. In general, plans to build over 900 thousand m ² of objects of different functions. 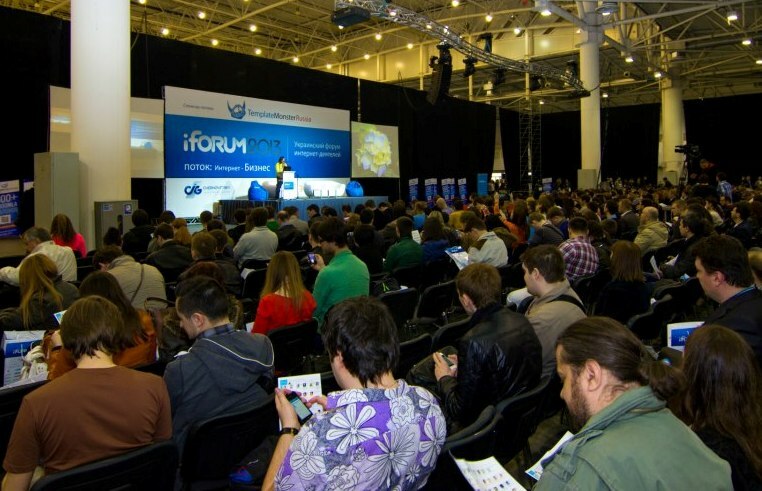 This year iForum attended by more than 7,000 participants. The conference placed their stands more than 50 major Ukrainian and international Internet companies, and was represented by a large number of local start-ups. iForum brought together top officials IT, including such figures as Anton Nosik (SUP), Igor Ashmanov (AIP), Dmitry Sholomko (Google-Ukraine), Katerina Kostereva (Terrasoft). And also - creators such as Nikita Seltzer (Caramba TV) and Alexei Ametov (Look At Me). Forum traditionally reflects trends of the Network over the past year and sets the vectors of development for the future. iForum 2013 was no exception. E-commerce, mobile applications and media market were the main trends of iForum 2013. Trending topics were also about freedom and restrictions on the Internet. As always, 100% was filled stream of online advertising. Lead of stream Evgeny Shevchenko noted participants' interest in the stability and increase the number of listeners. On the technological stream rose topic of cloud computing, high-loaded systems and "mobile" development - outlined the future development trends Sergei Korzh, presenter of stream. The head of the organizing committee Ol'shanskii said that changing the format of iForum was good for the conference, and the following year the organizing committee will move in the same direction. Prime Minister of Ukraine Mykola Azarov instructed to seriously address the development of Ukrainian culture. He stressed that the deal with this trend in the near future ordered by President Viktor Yanukovych. 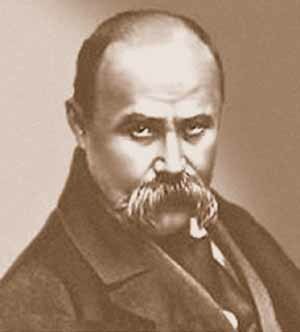 In particular, Azarov said that the government is preparing to celebrate the 200th anniversary of Taras Shevchenko (on the picture). "In the framework of the state program of celebrations in 2013 will be renovated park-monument of the former estate of Engelhardt and updated state will be displayed at the Shevchenko museum in the village Budishche of Zvenigorod district," - said the prime minister. He also added that the government is prepared and the celebration of the 120th anniversary of the birth of filmmaker Alexander Dovzhenko. Prime Minister did not like the volumes of book publishing in Ukraine. He promised that Ukraine will be one of the most reading nations in Europe. "We have a program promoting domestic publishing production and reading on the years 2014-18. The document is extremely important. We have no right to lose the position of one of the most reading nations of Europe. But the risk of this, unfortunately, is caused due to insufficient quality, range and limited editions of domestic publishing products, "- said Azarov. Ukraine is the leader among the CIS countries in the legitimate use of stem cells in clinical practice. As reported by the press conference in UNIAN - Ukrainian scientists - Biotechnology - Ukraine became the first country in the CIS, where stem cell therapies have received state registration in 2012, the Ministry of Health officially approved method of stem cell treatment of serious diseases such as panktreonekroz, critical limb ischemia , as well as injuries and burns. Director of the Coordination Center of organ transplant, tissues and cells the Ministry of Health Ruslan Salyutin stressed that Ukraine has the right to declare the promise of clinical use of cell-tissue grafts, and this allows the current national regulatory framework. "Today, from all countries of the former Soviet Union in Ukraine, there is a complete legal framework, which allows for clinical trials with stem cells. On the basis of the legal framework and the relevant permits in 2008 began the first phase of clinical trials, which were held in well-known scientific and medical centers - the Institute of Reconstructive and trauma surgery im.Gusaka, Institute im.Shalimova, National Academy of Postgraduate Education im.Shupika. A series of clinical trials could not have been possible without the participation of the Institute of Cellular Technology ", - said R.Salyutin. According to the director of the Institute of Urgent and Reconstructive Surgery im.Gusaka Vladislav Green. The idea of ​​using stem cells to treat burns and their effects, arose 15 years ago in medical facility, which Vladislav Green heads. "Then in the Donbass was the large number of accidents in the mines and other industrial enterprises, when our burn center were many patients with critical burns. There were nothing to close burns. Then I got the idea to use the latest biotechnology and grow from them a kind of skin. 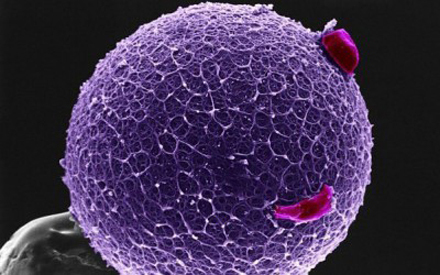 In 2003, we opened the laboratory of cell tissue cultivation, unique to this day. Now we have treated hundreds of patients burned, hundreds of lives saved. But we have seen that the ability of the laboratory extend far beyond burns. Therefore, we began to apply biotechnology in patients with severe trauma, fracture nonunion, false, false joints, then in cardiology, neurology, diseases of the gastrointestinal tract, liver cirrhosis, "- said V.Grin. Every year producers of wheat flour hope to get active and unimpeded experience of work on the market. However, annually the enterprises face various obstacles on the way to the prosperous work. It should be noted that during almost the entire first half of 2012/13 MY the situation on the export market of flour was relatively stable and measured, but in late 2012 the situation changed and presented the unpleasant surprise for flour millers. At the same time, since the second half of MY the current market trends changed again, indicating that Ukrainian exporters of wheat flour can "cross" through the existing problems of the market and continue moving forward. Thus, you can read in the current article about how the situation developed in the reporting season, and what difficulties had to be overcome on the way to successful work of grain processors. Despite the low selling rates of finished products last MY, many producers of wheat flour did not lose hope for improvements in the new season. Since beginning of 2012/13 MY, flour producers continued developing export trading of their commodities. The persistence of exporters led to increased rates of shipments of flour milling products. According to the market players, in the current season export volumes of the finished products can significantly overcome the result of 2011/12 MY. According to data of the State Statistics Service of Ukraine, during the whole period of last MY Ukraine exported 115.2 thsd tonnes of flour. At the same time, in the current MY from July 2012 to January 2013 the shipments totaled 116.2 thsd tonnes. Taking into account that there is enough time until the end of the current MY, flour milling enterprises are quite capable to increase the volume of flour exports. As for the main directions of flour supplies, we should note that in the current season the companies significantly increased the export volumes to the CIS countries. According to the State Statistics Service of Ukraine, in the period from July 2012 to January 2013 the supplies of flour finished products to the CIS countries grew to 62.9 thsd tonnes, an increase of 25% compared with last MY, when Ukraine shipped 46.9 thsd tonnes only. Also, in the reporting period wheat flour producers increased shipment volumes to the Middle East to 9.5 thsd tonnes, up 30% compared with the shipments in 2011/12 MY. Thus, Moldova (26.7%), Indonesia (25.3%) and Azerbaijan (17.7%) were the main three leaders of the countries-importers in the season. However, due to very rapid rates of flour shipments to Azerbaijan in recent years, the country can take the second position in the list of the main countries-consumers of Ukrainian wheat flour in the nearest future. Naturally, we can not ignore the major companies-suppliers of flour for exports. According to the State Statistics Service of Ukraine, the bakeries LLC "Kombinat Khliboproduktiv TALNE", "Lugansk-Niva Ukraine", Vinnytsia Center of Grain Production #2 became the leaders among grain processing enterprises in terms of foreign shipments in 2012/13 MY. It is worth reminding that in 2011/12 MY, Vinnytsia Center of Grain Production #2, LLC "Kombinat Khliboproduktiv TALNE" and Company "Enlil" were the leaders of flour shipments. According to the market operators, since the beginning of the current season flour millers were not expecting for new challenges. Thus, almost the entire first half of the current MY showed conventional, probably characteristic difficulties for the flour market. Traditionally, problems with getting rail cars for flour shipment by the milling enterprises and difficulties to ensure sufficient grain volumes for processing for the enterprises, prevented the stable operation on the market. However, many flour millers tried to cope with these difficulties, continuing to supply products on foreign markets as usual. The official report on imposition of the special duty on wheat flour at 20% of the customs value by Indonesia since the beginning of December 2012, became rather unpleasant and unexpected news for exporters of flour at the end of the first half of 2012/13 MY. 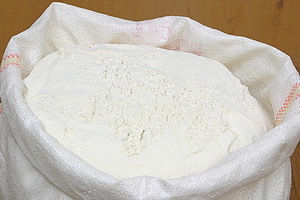 According to the market participants, the duties cover both imports of flour of food and feed purposes. According to grain processors, imposition of the reporting limitations on the imports of grain by-products to Indonesia was caused by the fact that the country intends to increase production of own flour volumes. In the new circumstances, a number of traders, supplying the finished products to the country, reported that they plan to increase the share of flour presence on the domestic market, and look out for a way to deliver the finished products to other countries. Also, grain processors reported about their plans to increase flour shipments to the main countries-importers of Ukrainian products. In particular, countries of Asia, the Middle East and the CIS were called as potential buyers of flour from Ukraine. Since the beginning of 2013 the situation on the export market of flour did not worsened, despite the fact that Ukraine lost the main importer of its products - Indonesia. On the contrary, due to the increase of prices for grains and by-products on the world market, Ukraine received additional opportunities to press its major competitors - Russia and Kazakhstan – on the export market. It should be noted that since the beginning of January 2013, Turkish companies reduced activity on the export market of flour. Previously flour producers in Turkey purchased grains from Russia and Ukraine, which are currently not active on the exports of milling wheat, and significantly reduced their grain processing operations. Despite the fact, some plants reported that Turkish flour exporters still remain the main competitors for the shipment of finished goods to African countries. However, the plans of market participants to increase the supply of flour on the domestic market failed, due to the fact that since the beginning of 2013 the Agrarian Fund entered the market, which used its reserves and activated flour supplies to bakeries. According to the market operators, the stocks of flour products reduced the consumer demand for commercial flour on the domestic market. And grain processors had no choice but increasing the exports of flour. It is worth noting that in the second half of the season, the export price for the finished product became the top-priority of Ukrainian companies. As of early March 2013, flour milling complexes declared the selling prices for top-grade flour at the level of 360-415 USD/t from the enterprise, down 40-100 USD/t compared with the main countries-competitors. Despite the fact that the offer prices for Ukrainian flour also increased compared with the beginning of the current MY, most companies are looking to the future with optimism. However, most Ukrainian companies are not afraid of the current lowering of flour prices on the domestic market of Russia. A number of companies plan to significantly increase the selling prices of flour, due to expensive raw materials, assuming that even with such increase of prices, the demand for the final products of Ukrainian origin will remain quite satisfactory. 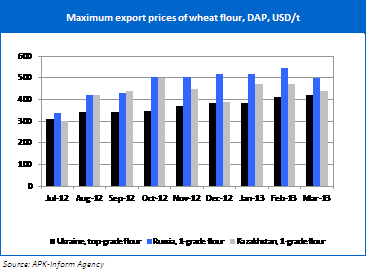 Taking into account the above mentioned factors, we can safely say that most of the season was not bad for the exporters of flour in Ukraine. Despite all difficulties and obstacles, the companies managed to keep the main selling markets for their products. However, in recent years more and more experts are saying that operators of the Ukrainian flour market need to expand into new markets for wheat flour. In the current MY flour producers showed quite good results, while expanding the geography of supplies. However, the final sum up will be possible at the end of 2012/13 MY only. Students Computer Academy "SHAG" won the Imagine Cup 2012 in Sydney on July 10 held a truly epochal event for the computer industry in Ukraine - the first time in the history of the Ukrainians won one of the most prestigious competitions of IT-technology areas - Microsoft Imagine Cup. Team quadSquad, composed of students of Donetsk Computer Academy "SHAG", won the most difficult category - software development (Software Design), which has struggled for more than 70 teams. They presented the world his socially oriented project called Enable Talk. Enable Talk according to the magazine «TIME» included in the list “Best Inventions of the Year 2012” along with The Curiosity Rover, Google Glass, self-inflating tires and many others. It aims at improving the communication of people with limited hearing and presents by glove equipped with a large number of sensors, such as sensors bend the fingers, a pair of accelerometers, gyroscope and compass, which allows you to gather information on the situation in the hands of the space in the future to transform a gesture to speech. The software part of the development (based on Windows Phone 7 / Windows 8) can receive information from sensors gloves and continuous transformation in the audio signal. The information received through Bluetooth is transmitted to the smartphone and after fast processing gestures sounded voice. This invention will help deaf and dumb people to communicate more easily and conveniently. 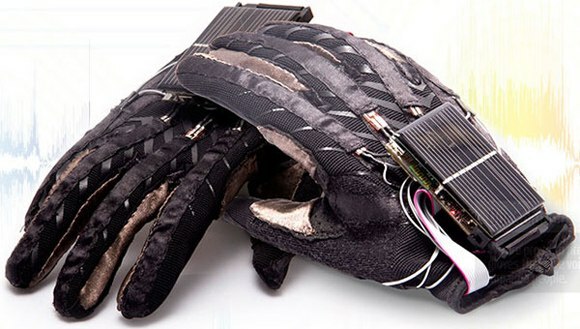 Also glove equipped with solar panels that optimizes its use. During the presentation, the team demonstrated the possibility of gloves, talking to the audience in sign language that is instantly translated into voice. All those present, including the members of the jury, said that they have not seen anything like this before and were also highly appreciated the ability Ukrainians not only to program, but also to solder chips with their own hands. To develop their project folks spent more than six months, it is expected that such a glove would be worth only $ 200. "Ukraine - one of the most prosperous countries in the world for Internet access," said Alexander Olshansky in the business breakfast CEO Club Ukraine January 24, 2013 in the President Hotel. Referring to the statistics, the speaker noted that the 12 million Ukrainian Internet users spread across the territory of Ukraine is fairly evenly: "Today, the normal access to the Internet is in many villages. We have the infrastructure in this area is better than in Germany, and England. "Olshansky suggests that by 2014, 70% of the population will have access to the Internet. A quick burst will be associated with the emergence of all kinds of mobile devices, providing access to the Internet as an alternative to expensive PC.